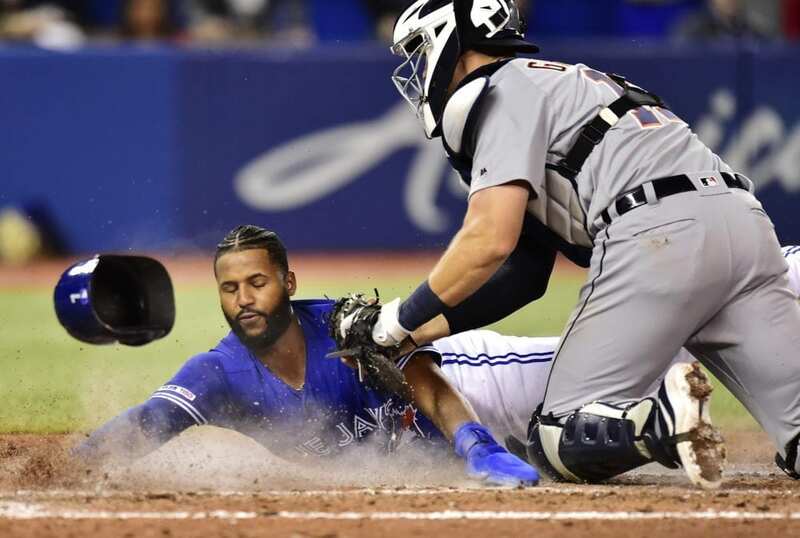 TORONTO (AP) — After getting blanked in back-to-back losses, the Detroit Tigers scored just enough runs Sunday to leave Canada on a winning note. 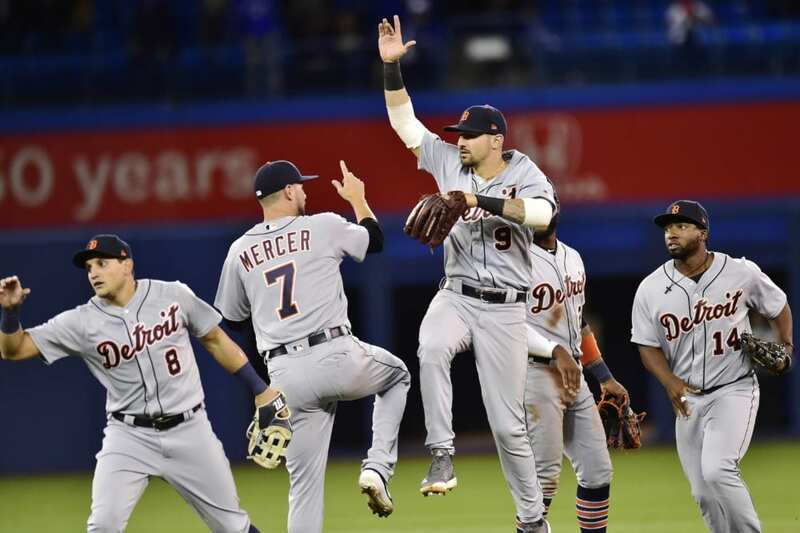 Nicholas Castellanos had an RBI single in the 11th inning, Jeimer Candelario got five hits and the Tigers beat the Toronto Blue Jays 4-3 despite blowing a late lead. Castellanos drove in catcher Grayson Greiner, and the Tigers salvaged a split of the four-game series to open the season. The decisive hit came off left-hander Thomas Pannone (0-1), Toronto’s eighth pitcher of the game. “It’s a really good feeling for the team,” Candelario said. Candelario drove in two runs and Daniel Stumpf (1-0) pitched one inning for the win. Toronto put a runner at third with two outs in the bottom of the 11th but Shane Greene got Teoscar Hernandez to line out for his second save. Candelario came in 1 for 12 on the season and 0 for 9 with seven strikeouts since his lone base hit on opening day. He singled in the first, sixth, seventh and 11th, and doubled in the ninth. Trailing 3-0 in the eighth, the Blue Jays tied it against Joe Jimenez when pinch-hitter Rowdy Tellez hit a three-run homer to center field. 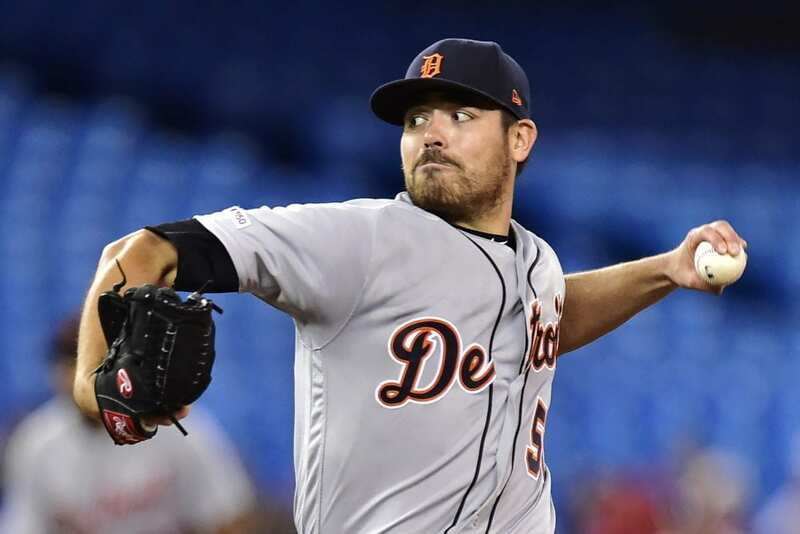 The drive undid seven shutout innings by Tigers starter Matt Moore. Making his Detroit debut, the left-hander allowed two hits, walked one and struck out six. Moore was perfect through four before walking Randal Grichuk on a 3-2 pitch to begin the fifth. Moore lost his no-hit bid with one out in the sixth when Richard Urena grounded a single up the middle. Danny Jansen’s two-out double moved Urena to third, but Moore escaped by fanning Brandon Drury. After doubling against Stumpf in the 10th, Urena tried to score from second on an infield single by pinch-hitter Freddy Galvis. Mercer, who had dived to his right to corral Galvis’ hit, threw home from his knees in time to retire Urena and send the game to the 11th. Scrambling after the loose ball, not looking at the runner, Mercer said he knew Urena was trying to score when he heard the crowd noise rise. Gardenhire praised the veteran Mercer for keeping calm. “That was a big, big moment for us,” Gardenhire said. Detroit, which had mustered two runs through its first three games and none since the 10th inning on opening day, snapped a 24-inning scoreless drought with a three-run seventh. Javy Guerra issued a bases-loaded walk to Mercer before Candelario followed with a two-run single. Making his major league debut, Blue Jays right-hander Trent Thornton allowed two hits in five shutout innings. Toronto starting pitchers have worked 24 consecutive scoreless innings to begin the season, tripling the previous club record. It’s baseball’s longest such streak since Atlanta starters threw 25 shutout innings to begin the 1994 season. 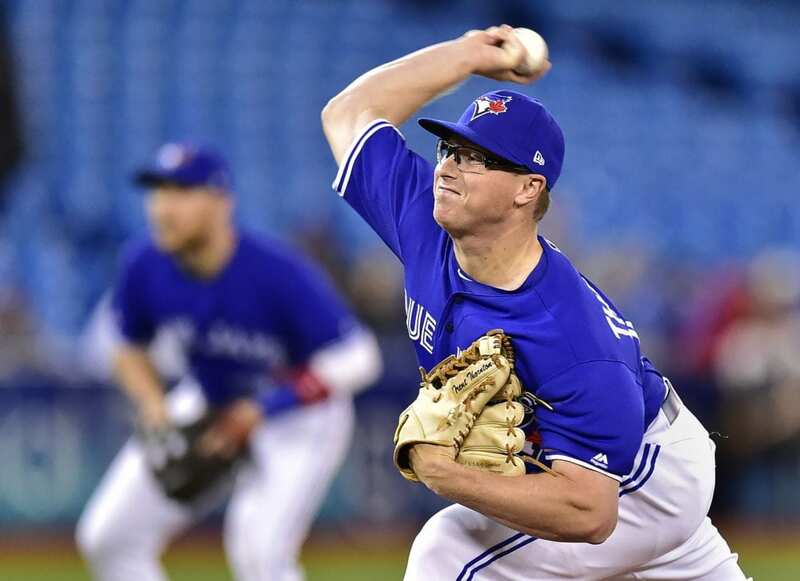 Thornton struck out eight, the most by a Blue Jays pitcher making his first big league appearance. The previous record was seven, jointly held by Matt Boyd and Marc Rzepczynski. Thornton wasn’t the only Blue Jays pitcher to make his debut. Right-hander Elvis Luciano, who turned 19 in February, became the youngest pitcher in team history when he replaced Guerra in the seventh. Luciano, selected from Kansas City in the Rule 5 draft at the winter meetings in December, is the first big league player born in this century. He allowed one hit in 1 1/3 innings. Blue Jays pitchers combined to strike out 50 Tigers batters over the four games, a team record. Toronto struck out 48 Houston batters during a four-game series in July 2013. Tigers: Miguel Cabrera started at DH. Cabrera left Saturday’s game after being hit on the right hand by Aaron Sanchez’s pitch in the sixth. Blue Jays: Galvis (lower back) was scratched from the starting lineup and replaced by Urena. Galvis extended his MLB-leading streak of consecutive games played to 329 when he pinch hit. … LHP Clayton Richard (right knee) will not make his scheduled start Monday against Baltimore. RHP Sean Reid-Foley will start in his place. 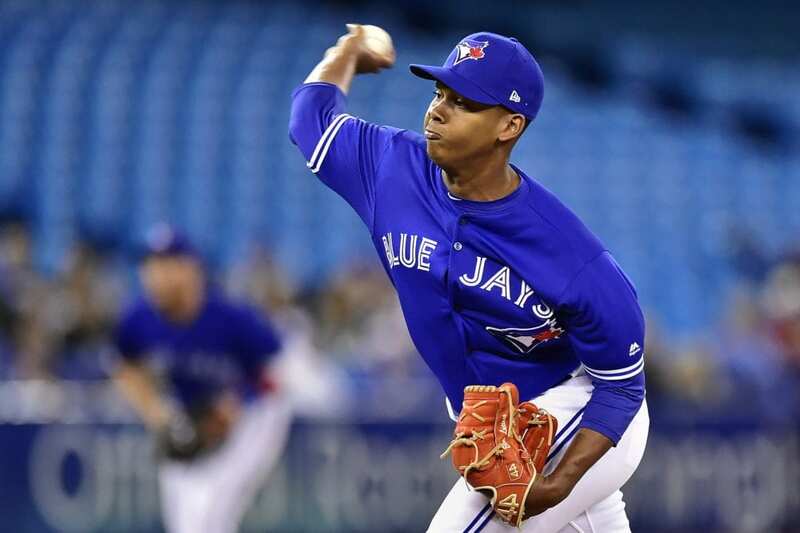 … Thornton started in place of LHP Ryan Borucki (left elbow). Borucki is expected to throw off a mound sometime this week. Tigers: RHP Tyson Ross starts Monday in the opener of a three-game series at Yankee Stadium. Ross is 0-3 with a 6.88 ERA in six career games against New York. Blue Jays: Reid-Foley went 2-4 with a 5.13 in seven starts for Toronto last season. 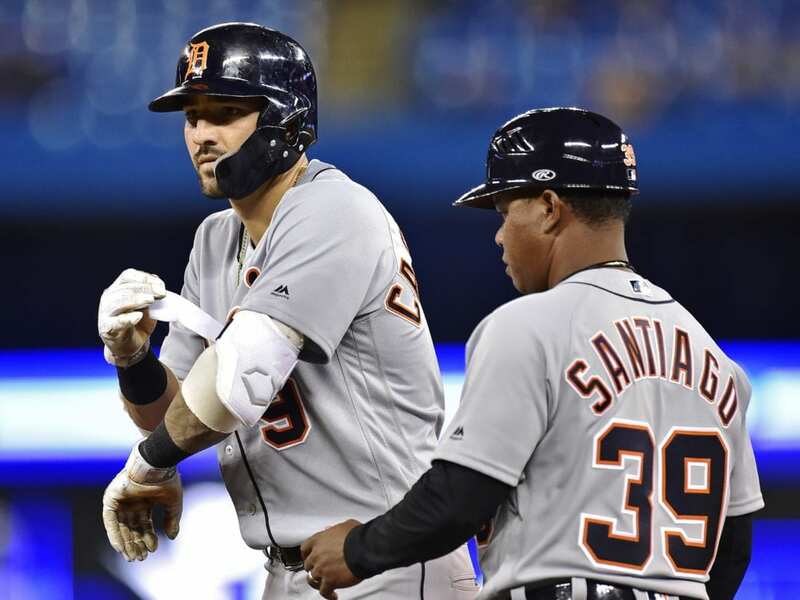 Be the first to comment on "Castellanos Lifts Tigers Over Blue Jays 4-3 In 11 innings"